Interactive maps are neat. It’s not hard to get a basic map embedded on your page, but Google provides a rich and easy to use API for embedding and decorating maps on your web page, so there should be no excuse for boring default maps. 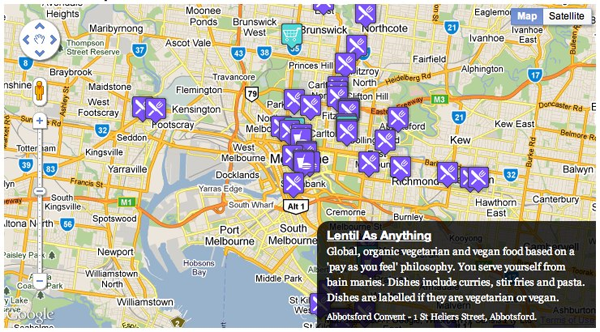 In this article I’ll share a technique I used recently to spice up the “Places to shop and eat” map on Vegan Melbourne, using a combination of the Google Maps API, jQuery animation, and some newer CSS effects. For the other option, Google provides an API to add placemarkers and other features in real time to a map. This is what we will be using in this article. Note that we are using version 3 of the APIâ€”many tutorials you will find on the internet are using an older version which has been deprecated. To get started, we need to load up jQuery and the Google Maps API library. Note that when including Google Maps you have to set the sensor parameter to true if you are detecting the user’s location (say via GPS). For the typical browser scenario though false is fine. That doesn’t show a map yet, it just gets everything ready with the right libraries loaded and a div to place the map into. The rest of the article will assume this basic template. Every page with a map on it will need to start by actually creating a map object. This is done by specifying some basic options, such as the initial location and zoom level, and the container to place the map into. From here, we can place various items on to the map. The most common is the “Placemark”, which you have no doubt seen on countless maps, but there are other options such as circles and images. Let’s put a marker on top of Flinders St Station, the hub of Melbourne’s train network. There are plenty of options for making your markers a little more snazzy. Let’s give this one a nicer icon and some gratuitous animation. That bounce is quite annoying. Please do remove it again before continuing. I believe I have made my point: you can customize your placemarks. The Google Maps API exposes a large number of events that we can react to in our program. They are documented against each type of object you can place on a map. For this example we will stick to the plain vanilla click event, but there is plenty of scope for interesting interactions with other mouse events and drag/drop. This is a pretty major train station. It also requires some styling for the new “info window”. There are quite a few lines of CSS in the following snippet, but don’t panic it should be pretty simple to follow. The important parts are labeled with comments. * when it is "off map"
Now we have a structure that we can wire up using jQuery. The first step is to make the window simply slide in and out in response to the click event on our placemark. This is a great start, but we need to abstract it out somewhat if it is to scale to more than one placemark. Let’s add Southern Cross Station to the map, the other major rail hub in Melbourne. To do this we will separate our data from our code by moving the definition of a placemark out into a hash. This is always a good idea that leads to understandable and maintainable code. This is a neat extractionâ€”it is now easy to see and add new places, as well as adapt to any extra meta-data that may be available (such as a phone number for the place). Being able to deal with arbitrary extra meta-data is a strength of this approach which is not easy to do using KML. Note how easy it is to change the title and description of the info window using the jQuery text function. The other benefit is that the underlying data for the map can now be served up from elsewhere, such as a server process generating JSON on the fly. Move the places array out into a new file places.json (without the var places = part), and we can fetch it easily with jQuery. You may have trouble running this part if you are testing directly off the filesystem due to ajax security policies. The easiest way around it is to serve up both files via a webserver, which is an easy one line if you have ruby installed, otherwise putting it under your apache www root may be comfortable for you. You now have the framework needed to go forth and make your own pretty maps. For bonus points, we can clean up the user experience a bit. When you click one station, then click another, it is currently a bit … bland. There is also no indication on the map as to which marker is selected. Let’s slide the window out again before switching the data, and change over the icon of the currently selected item. Much nicer. That looks totally ace. Google Map Icons is a gold mine of icons you can use and adapt for your map. Do donate if you use them! If you really want to serve the JSON data across domains, look into JSONP. If you install the json gem under ruby, you get access to the prettify_json.rb script, which you can pipe json into to make it easy to read. That one line ruby server is pretty much unkillable. My roundabout way is CTRL-Z to background it, then ps | grep "ruby -rwebrick" | cut -d ' ' -f 1 | xargs kill -9. Feel free to suggest a better way in the comments! The Google Maps API documentation is really quite spectacular. Get comfortable with it.